2 go into the case! Five Autographs or Memorabilia Cards Per Box! Immaculate Collection boasts the most diverse collection of game-worn memorabilia sets of the year, which feature jumbo jersey swatches, patches, emblems, logos, and logoman. Shoe Cards! Sneaker Swatch Signatures, Laces (new! ), Tongues (new! ), Sneak Peek, and Sneaker Swatches all feature specific swatches from shoes of some of the most iconic NBA stars--past and present! Rookie Patch Autographs and parallel versions all feature prime memorabilia and on card autographs! Find Dual, Triple and Quad Autographs, including Dual Rookie Logoman Autographs! 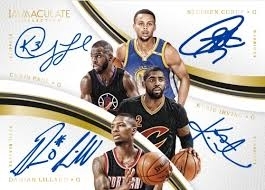 QUAD AUTOGRAPHS: Quad Autographs showcase player combinations from the same team, draft class, country, and more! DUAL ROOKIE LOGOMAN AUTOGRAPHS: These top rookie pairings feature on card autographs and logoman swatches from each! SNEAKER SWATCH SIGNATURES: Find a list that pairs players like Shaquille O'Neal, John Stockton, and Karl Malone with the rubber and leather that kept their tires on the road! MILESTONES: Celebrate timeless NBA moments with the players who achieved them, and their autograph to commemorate them! NAMEPLATE NOBILITY: Looking for a chase? Each player features one unique card for every letter on his nameplate! LOGOMAN: Every card is a one of one, and each displays a full logoman swatch!